Is it a case of the underdog finally ascending to the throne? Or simply that we’re all so cash-strapped, we’ve learned to love this plentiful, and extremely affordable, material? Or perhaps somehow a confluence of the two? After all, for plywood to look beautiful, it needs to be expertly handled. It most certainly isn’t about just slapping down a few sheets and rollering on some varnish. Rather, it’s like minimalism in architecture: to do it properly takes time, expertise, extreme attention to detail and money. So why do I feel as if I’m seeing playwood everywhere at the moment? Certainly all materials and finishes have their fashionable in moments and outs, but plywood seems to be resonating very strongly as a material that feels super right for now. I’m intrigued as to why. After all, for quite a while brass has been in the spotlight, then copper came back again, then it seemed we decided that actually copper with brass (and a touch of terracotta) was the way. Ultimately, I feel the current mood for materials with such strong characteristics is all about a search for extreme tactility, and therefore connection. Whether that’s connecting us with nature, with ourselves as sentient beings, or physically to the space which surrounds us. Why? Because for many of us today, life is increasingly experienced through screens; at both work and home via computers, tablets, smartphones and TVs, all smooth, glassy and resolutely regular. As a counter to this, I find ourselves literally craving something different to touch, something knobbly, wobbly, irregular and deeply textural, in other words, surfaces that are as far removed from a de-personalised computer screen as is possible. If we step back a moment to consider the context, then wood has always had an inherent honesty to it. We know where it comes from, we trust it, it weathers well and has a cosy familiarity to it. I’m not sure I’ve seen a house yet that hasn’t included wood in some form or other. It’s also tremendously versatile, in that it can speak many different languages: rough and rustic; deep and dark; pale and interesting. And plywood, well to my mind, this both is, and isn’t wood. To explain: from one perspective it’s like super-pimped wood, being composed of wood layers glued together such that it becomes exceptionally strong. But it is made of real wood, which I don;t think people realise. This isn’t MDF. Additionally, it can be made from any type of wood, it’s just that the most popular tends to be birch, which is what most people visualise when thinking ply. It also looks like a sort of exaggeration of wood, one in which the grain is particularly prominent, which is a result of it being applied as sheets, rather than planks, which suits the au courant flavour for a touch of flamboyance. When architects and interior designers go plywood, it tends to be wholesale, rather than just a little touch, precisely because it’s so fantastically adaptable. Whereas wood, generally, within modern urban homes, is confined to floors and furniture, plywood can be used everywhere and on everything, and because it’s cheap, creative folk have been able to experiment accordingly. 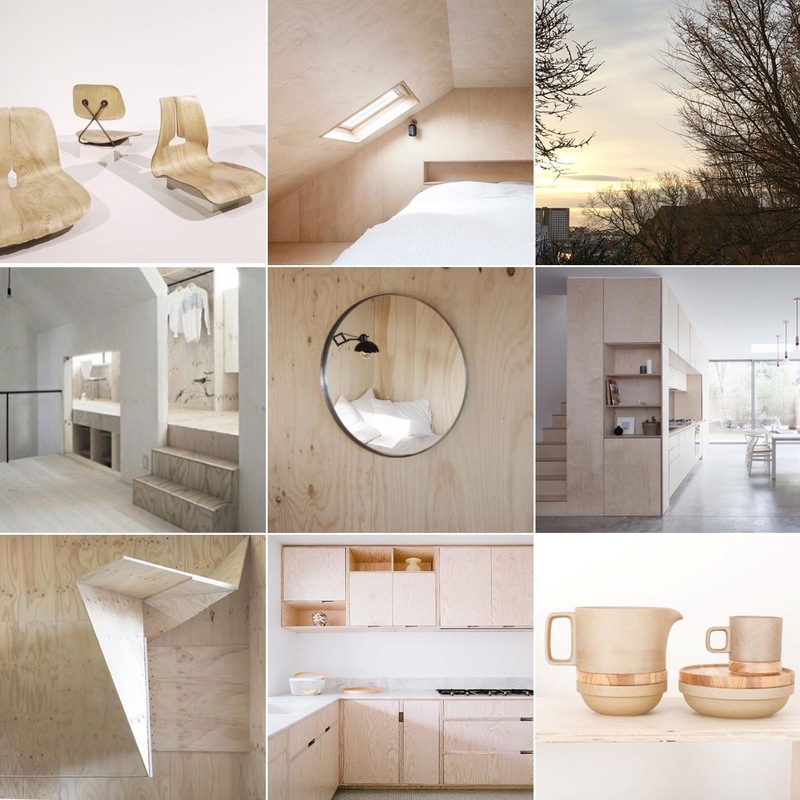 So in many ways, plywood is 21st Century wood, in that is it both authentic and modified; affordable and adaptable; capable of being both luxe and everyday; and therein lies its appeal. Flemming Skude Copenhagen-based architect whose stunning summerhouse is featured in this post and in our February 2017 ‘Trends’ edition. Simon Astridge a London-based practice famed for its Plywood House, where plywood was chosen as the single wall, floor and ceiling material for a Victorian house extension in South London. Bedroom shown above.